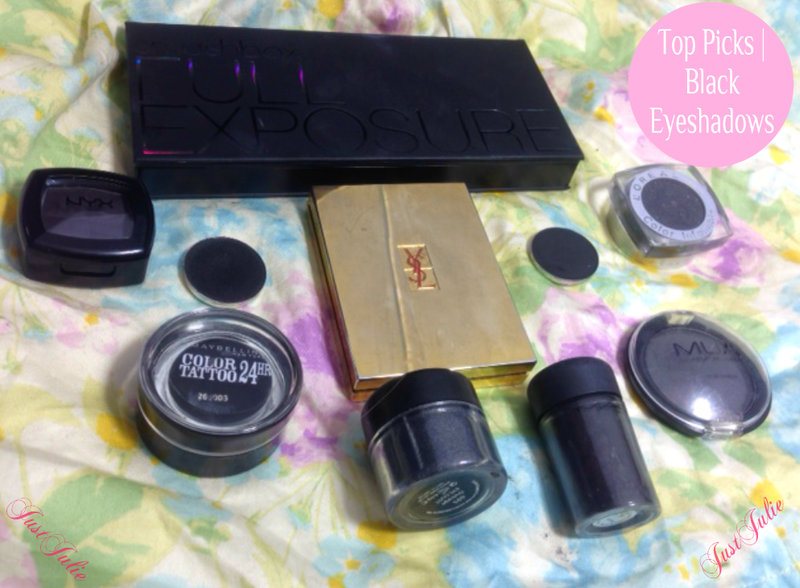 Following on from my Top Picks | Budget Beauty Brands post last week, which was hugely successful I thought I'd give you my top picks for black eyeshadows. If you read my blog regularly you'll probably be aware that when it comes down to makeup I'm not the most neutral girl in the town, although I have started to experiment more with neutral colours I honestly feel more comfortable wearing either a bright eye look or a smokey eye. I was planning on doing a makeup look post today but one of my eyes won't stop watering so I looked through my mountains of eyeshadows and the black colours were just jumping out at me. I don't know about anyone else but I've always found it hard to find a black that I really love. I want a black with a lot of pigment so that I'm not continuously needing to build the colour up, a black that doesn't have too much fall out, a matte black that is actually easy to blend in and when it comes to black with glitter or shimmer, there often seems to be huge glitter chunks that literally do nothing and look crap! I have a lot of black eyeshadows so I've gone through my collection and picked out the ones that I will tend to gravitate to. Let's start with the highstreet options. NYX Single Eyeshadow in Matte Black, £5 I love NYX and I will continue to keep saying that! This is a newish purchase for me and one I wish I had bought ages ago! This is completely matte, no sheen, no shimmer FLAT MATTE and it's amazing! The pigmentation on this eyeshadow is just crazy, there is sooo much! It's really easy to blend in too, although there is some fall out, but you generally get that with black matte eyeshadows and it's nothing too OTT! I love the square packaging of the single eyeshadows also! You get 2.4g of product for just £5 and trust me, this will last a life time as a little honestly goes a long way! L'Oreal Infallible Eyeshadow in Eternal Black, £6.99 These are some of my favourite eyeshadows that I have in my collection. This is a black with glitter particles. The glitter doesn't disappear like a lot of glitter shadows and it really shows up on the lid, which I personally love. They're half pressed pigments which I love as you don't get the fall out that comes with a loose pigment but you get the amazing colour pay off! Again a little goes a long way so there is no need to go in heavy handed with this. I love to use this when I want a smokey eye but one that will have a little bling bling! These are also a complete dupe for the Giorgio Armani Eyes to Kill Intense Silk Eyeshadows which retail at £26.50 for 4g! There is 3.5g of product in this so it's really great value for the price. Sleek Eye Dust in Outrage, £2.99 These little eyeshadow pigments were my first post just HERE. Sleek do sell a matte black pigment which I own but I prefer this shade. Similar to the finish you get from the MUA shade 15 I mentioned above as it has a pearl finish to it. What I love about this is the more you blend it in, the true the colour comes out (does that make sense?) I mean normally you blend a colour in and the colour will fade, whereas with this the colour becomes truer to what you see in the pot. Don't worry you can soften the colour up, just use a blending brush with no product to it and lightly blend. You need to work fast with this because once the colour has set that's it, it's going no where! Which is also good as you don't need to apply a primer with this! As it's a loose pigment there is fall out, but apply it before you do your base or pop a tissue under your eyes to catch the fall out and you're good to go! You get 6.5g of pigment here. Maybelline Color Tattoo 24hr eyeshadow in Timeless Black, £4.99 So steering away from the powder shadows I really couldn't do this post without giving a nod to Maybellines 24 hour tattoos. This is an amazing eyeshadow which also doubles up as a eyeliner. The colour is a true black and is perfect for anyone wanting to create the ultimate smokey eye look. You can literally just use this eyeshadow all over the eye without the need to use multiple shadows. Apply it lightly to your eyelid, blend in and then apply more colour to the outer V of your eye to darken the look up. These live up to their name and stay put! Again no need for a primer as they are literally tattooed to your eyes! Now moving on the higher end options. 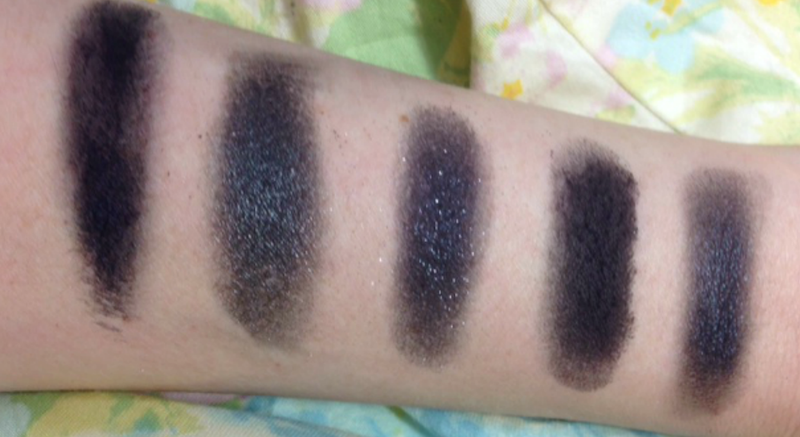 From Left to right: MAC Pigment in Dark Soul. Smashbox Full Exposure Eye Shadow Palette in M7. YSL Pure Chromatics 12. MAC Eyeshadow in Carbon. Makeup Geek in Corrupt. YSL Pure Chromatics 12, £39 So The darkest shade in this palette is a gorgeous glittery black shadow. The glitter particles are so fine and look amazing on your eyes (the swatch really doesn't do it justice) The colour is quite soft but that's what I love about it. 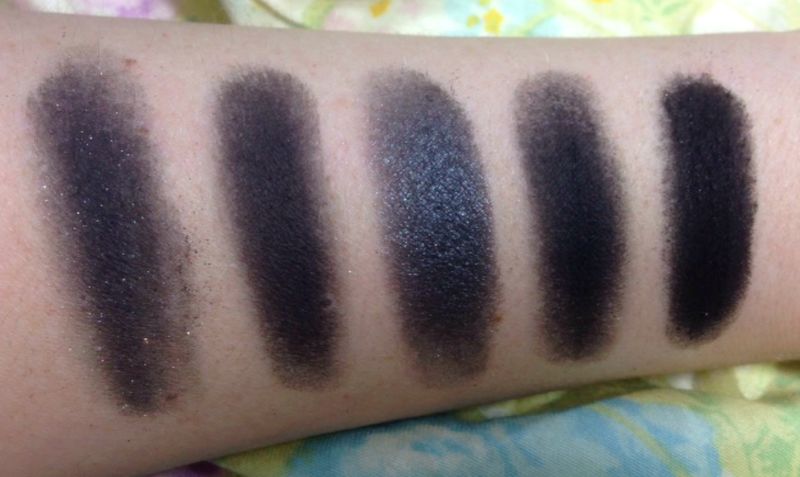 This is actually my favourite palette to create a smokey eye look, all four colours are gorgeous and can be applied dry for a softer look or wet for a really dramatic look. I've not used any of these colours for a while as I don't want to run out of it due to the price but I'd 100% repurchase this as it's just gorgeous! The whole palette is just 3g but it's gorgeous so I don't care about how little product I get for the money! Smashbox Full Exposure Eye Shadow Palette, £36 So another black eyeshadow from a palette. This is my latest purchase (last Saturday to be exact) This palette has a gorgeous creamy matte black shade named M7. It's a softer black option but it's gorgeous. Firstly as I said this is sooo creamy for a matte shadow, it's a dream to apply and blend in which we all know is hard for matte shadows. There is NO fall out so another big plus. I've not used this without a primer yet but it did last on my eyes all days without any signs of creasing. This will be ideal for those who want a smokey eye but don't want it too dramatic. A full review, along with some eye looks from this palette will be coming soon hopefully. The whole palette is 14g which is really good! What is your favourite eyeshadow to create a smokey eye, dramatic or softer?